Looking for a boat that’s perfect for longer trips? Don’t look past the Spirit range of boats. Our Quintrex Cabin Boats are designed with more storage and shelter to make the boat more comfortable for longer periods on the water. With the large rear space, it has plenty of room for a fishing trip or to fit up 7 passengers, so none of your all your family and friends have to miss out! 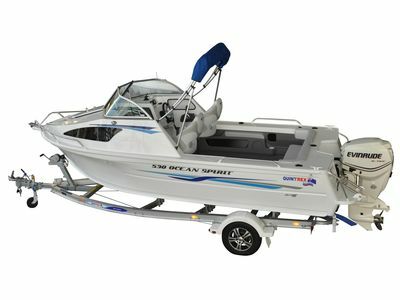 Get ready to cruise those waves with our excellent selection of cabin boats for sale. The 510 Sea Spirit is the perfect boat to get your family out on the water. Perfect for cruising around the bay or fishing for the weekend complete with durable aluminium side pockets and a rear lounge for relaxing. Durable and tough, you'll always have peace of mind cruising in a 570 Sea Spirit. 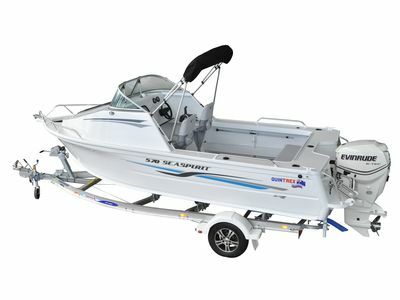 This boat is made tough to handle a variety of conditions with smooth, plate look sides, 4mm bottom sheets and the Blade Hull. The beauty of the 530 Sea Spirit is the versatility;it can take you anywhere. This compact cabin features a spacious cabin design and rear lounge perfect for weekends away with the family or long fishing trips with your mates. However you wish to spend your time on the water, the 570 Ocean Spirit is the perfect platform. The deluxe cabin is perfect for the family whether it's water sports, just cruising around or some serious fishing. Rated up to a 150hp you will love taking this cabin out on the weekend. After a long day out on the water the kids will love resting on their way back in the spacious cabin. The Blade Hull ensures a superb ride on this model and safety for the family. If you're after a little bit of luxury in a compact package, this is the model for you. With plenty of features included as standard, like the new rear folding lounge and walk-through cabin hatch.